Commander is a casual multiplayer format in which each player's deck is led by the legendary creature of their choice - fittingly, that's the deck's commander. The rest of the deck is made up of a specially crafted arsenal of creatures, artefacts and other spells, designed to reflect the personality of the commander and take advantage of their strengths. 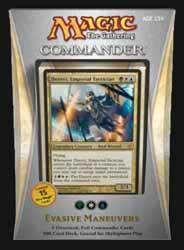 The commander itself starts the game face up outside your deck, in a special area called the command zone. Not only does your commander get to witness all the action from this lofty perch (and, of course, intimidate your opponents right from the get-go), you can cast your commander from there. That makes it an ever-present threat to show up on the battlefield and personally take charge. If your commander dies, you can whisk it right back to the command zone instead, where it's ready to be cast again. There are five Commander decks available: Power Hungry, Nature of the Beast, Eternal Bargains, Mind Seize and, the pack we were sent for review, Evasive Maneuvers. Each deck contains a 100-card deck; three oversized foil commander cards; deck strategy insert with rules for the Commander format; and a Magic "Learn to play" guide. It's another impressive addition to the ever expanding Magic universe.